Andes Website - Climbing holidays in the Lake District of Chile. Easy Mountaineering ascents in southern Chile. This short expedition is based in the exceptionally beautiful Lake District of Chile where we aim to make ascents of at least six volcanoes over a period of two weeks. 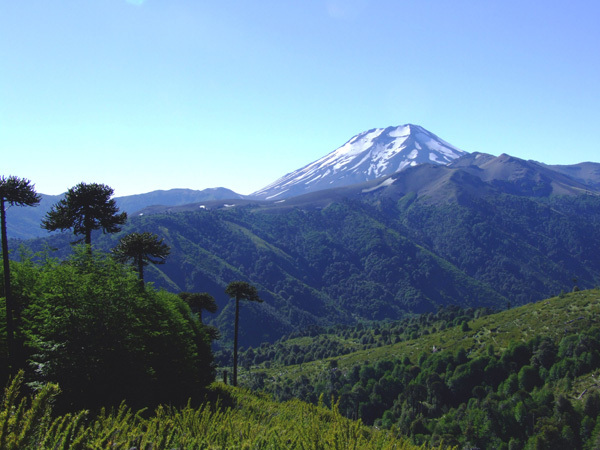 The summits we plan to climb include Villarrica, Tolhuaca, Lonquimay, Llaima, Choshuenco, Puyehue and Casablanca. The highest of these peaks is the impressively active Volcan Llaima at 3125m. This itinerary is designed to be flexible as there are occasional days of bad weather, and we may substitute a different summit if we feel it is appropriate due to client fitness or aspirations and/or road and weather conditions. Villarrica and Llaima are both active volcanoes and sometimes put on a spectacular show. 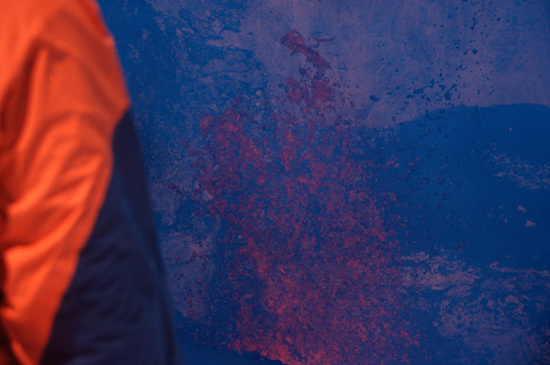 Red hot lava can sometimes be seen in the crater of Villarrica volcano and Llaima erupted two days after we climbed it in January 2008. Other highlights of the trip include forests of monkey puzzle trees, the beautiful glacial lochs with volcanic black sands and the long summer evenings in the southern hemisphere summer. Added to this are the laid-back towns and villages with excellent tea-rooms and restaurants. This should be a memorable trip and a great way to make some easy mountain ascents. Although all the ascents are relatively easy, clients should be fit and experienced walkers, ideally with some previous winter or alpine walking experience. An ice-axe and crampons are needed for several of the ascents, but previous experience of using these is not essential. We can hire these to clients who do not have them, and also instruct you in their use during the expedition. Lava in the crater of Volcan Villarrica. The Andean Lakes District has one of the largest concentrations of national parks in South America and is one of the most scenic areas of the world. The scenery is an unusual and beautiful mixture of volcanic and glacial; deep blue lochs, rich green pastures, forest covered hills and ice capped volcanoes. The Chileans have set up parks to preserve this scenic grandeur and we will spend time in four of these; Puyehue, Mocho, Villarrica and Conguillio. The attraction of these parks lies mainly in their superb mountain scenery and extensive areas of native forest where many species of beech (coehue, nire and lenga) and the monkey puzzle tree (araucaria) grow. Wildlife, particularly birds, are also common in the parks and we have seen Condors, Parakeets, Pitios, Chuncho, Flamingos, Bandurrias and Chilean Plovers frequently in the past. Volcan Lonquimay from the east. Lonquimay is an active volcano, with a blown out crater at the summit and a very recent lava flow on its flanks. It is one of the shortest summit days that we do, starting from the road end above Malalcahuello in some beautiful monkey puzzle forest. The ascent is up wide ash slopes, followed by a walk up a narrow ridge. the neighbouring peak of Tolhuaca is a longer ascent taking a very full day, through beautiful Monkey Puzzle forests and passing the attractive Laguna Blanca. Tolhuaca from above the Laguna Blanca. 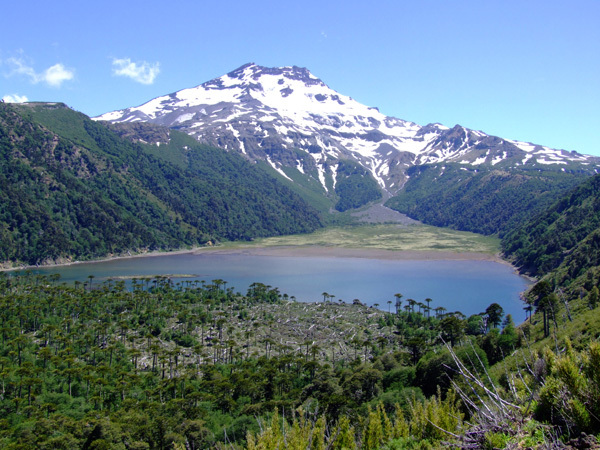 Volcan Llaima 3125m is a beautiful symmetrical cone which rises above the monkey puzzle forests of the Conguillio National Park. 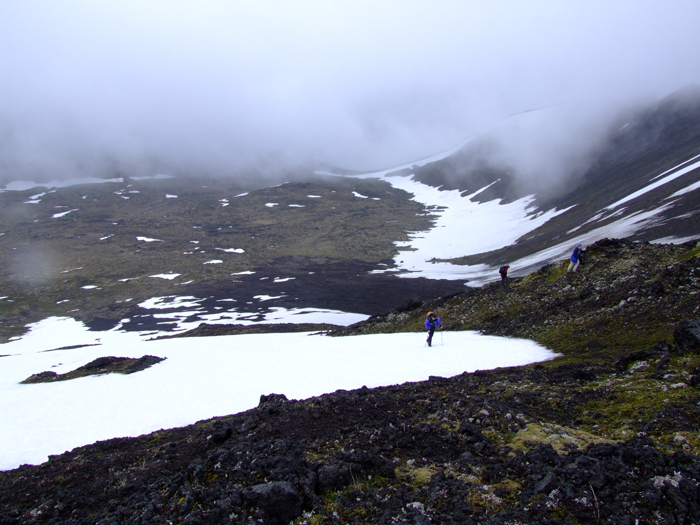 The ascent by the northern flanks takes one long day from the national park station near the snow line. It is relatively strenuous due to loose volcanic ash but the view of the steep summit crater is well worth the effort. The volcano is active and emits steam and ash from time to time and erupted with some lava as recently as January 2008. Llaima smoking on our ascent in 2007. 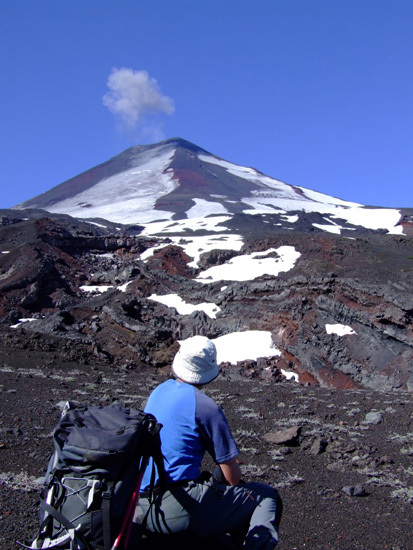 The ascent of Volcan Villarrica will probably be the most memorable day of this expedition. It is a highly active volcano which last erupted in 2015. From the edge of the crater it is possible to look down into a lake of red hot lava, which has been boiling and foaming on almost all of the twelve occasions we have climbed the mountain since we first did so in early 1993. You can feel the ground shake and you also get to breathe in some of the world's worst smelling gas! The activity of Villarrica does vary from year to year but is never disappointing - it is probably not entirely safe either, but the volcano is monitored by scientists in a station near the end of the road. The mountain is 2847m high, and an easy ascent over scree and snow slopes in one day from the end of the road. One of the highlights of the expedition is the trek into the beautiful wilderness around Volcan Choshuenco 2422m. this volcano lies in a remote valley about half way between Osorno and Villarrica and we will climb it over two days with an overnight in a hut at about1000m. Last time we went here we saw many tarantulas on the walk in, then enjoyed a barbecue and spectacular bivouac under the stars. The tarantulas did not re-appear.! Choshuenco from just above the mountain hut. One of the shortest and lowest of our ascents, Casablanca rises above the small ski resort of Antillanca. Again it is a day ascent from a ski hut at the end of the road. From the summit there are beautiful views out southwards to the dramatic peaks of Puntiagudo and Osorno volcanoes. A cloudy day in the crater of Volcan Casablanca. Volcan Puyehue is an active volcanic plateau located near the main road through to Argentina from this part of Chile. We will climb it over two days with an overnight sty in a primitive hut at about 1600m (sleeping bag required). Clients should be keen walkers or have previous trekking experience. A good standard of fitness is essential to make the most of this holiday. 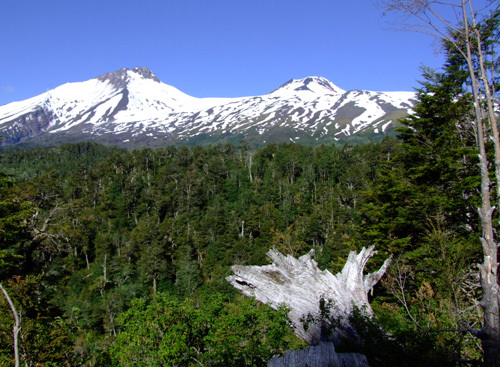 We will be backpacking to reach the huts on Choshuenco and Puyehue, otherwise we will only be carrying day sacks, although these will include ice-axes, crampons and some climbing gear. Winter skills including use of an ice-axe and crampons will be needed for some of the volcano ascents but because we will only be on easy snow slopes any customers without such skills can be instructed during the expedition. It is not essential to have these skills before joining the expedition. All the ascents will be over rough mountain terrain and occasionally loose scree or ash. If you want a holiday with only hot sunny days northern Patagonia is not the best place to go! However it does get plenty of good weather between occasional periods of rain. Rainfall and temperatures are similar to those in France during summer. High on the mountains it will naturally be quite a bit colder and windier with conditions roughly like those in the mountains of Scotland in April or May. All clients must be insured for medical costs and repatriation in an emergency. We recommend having insurance for baggage, personal liability and cancellation as well. If you would like further advice please ask. Vaccinations for tetanus, typhoid and polio are recommended. Chile is a well developed country that is very safe and relaxing to travel in; theft and muggings are no more likely than they are in most of Britain. Tarantulas are common in the region, this one was seen on Volcan Choshuenco. Remoteness : You will be up to a days walk from professional medical help for periods of time. Mountain Hazards : In certain places you may be subjected to a slight risk of rockfall. In stormy weather there might be a slight risk of avalanche. There are also slight risks from bad weather, volcanic activity and steep snowy ground on the volcanoes of the Lakes District. Our trips are designed to be small and flexible. The expedition will be co-ordinated, organised and led by us, but as far as possible will adapt to the plans and aspirations of the members. We will consult you when planning the details of the expedition. We aim to use weather forecasts so that (as far as possible) we will climb on the best days and either rest or travel on the less good days. Please note however that the leaders decision is final where the safety of the group or any member is in jeopardy; for example where retreat or diversion is necessary due to illness or bad weather. The maximum size of the expedition will be five customers plus leader. There are many species of birds commonly seen in the Lake District, including species of owl, eagle, geese, duck, swan, ibis, flamingo, woodpecker, plover, parrot and finch. We are quite likely to see the magnificent Andean Condor too. A much rare sight would be a puma (mountain lion).